The news has been met with a mixed response from Microsoft communities as you’d expect. The feedback over on Microsoft’s Technet forum has some users outraged that software they’ve in some case purchased 4.5 years ago is now obsolete, while there are plenty who accept the announcement as just part of the inevitable refresh cycle. While I’m sure it won’t provide much consolation for those businesses whose budgets are already stretched, working for a software company I can empathise slightly with the decision to call time. Supporting legacy products for long periods can be highly resource intensive and off to the detriment of the new releases. Regardless of opinions on the decision, what is undisputed is that this leaves an important question to be answered…. Where does this leave Exchange 2003 customers? 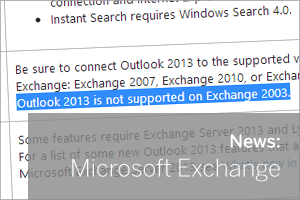 Exchange 2003 is obviously pretty long in the tooth now and there are tons of new features and security/ stability improvements in 2013. This isn’t a simple over-install however and is likely to require significant investment in higher specification server hardware and operating system upgrades. Microsoft have made no secret of their grand vision and it is in the cloud. Whether it’s Office365 or solutions from providers such as Cobweb or Rackspace – hosted (or ‘cloud’) Exchange promises lower initial upfront costs than on-premise solutions but the total cost of ownership over a few years can soon mount up. Migrating to a cloud service will also require the moving of a potentially large volume of sensitive data over an Internet connection and subsequently the trust in a third party to keep it safe and secure. For those companies who can’t justify the expense of Exchange and who would prefer not to use cloud services, there are a number of Windows-based alternatives to Exchange available, offering similar functionality and a lot more, but at less cost. We’re distributors for one such product so my recommendation is slighlty biased in this area, but if you are looking at an alternative, there’s no doubting that you should at least be downloading the free 30-day trial of MDaemon Messaging Server from Texas-based Alt-N Technologies.